I’m a typical mom. (At least, I think so). When I was single, or before I had kids, or when money was more up than down, I took better care of myself. That includes all non-essentials – like personal care products (better, nicer, more expensive), massages, nail care (pedicures anyone? ), and even vitamins. Less money plus more stress (kids busy-ness, work, finances) equals me not taking care of myself. This happens frequently. (Even though I work and make a decent income my husband is a freelance writer and actor so our income is up and down, up and down. Did I mention up and down?). But my mom was in town last week and my mom likes to spoil me. As she put it, as my mother it’s her right to buy me those things I want but won’t buy myself. I love her! So, she took me to The Body Shop because she uses their Vitamin E cream for anti-aging. While there we discovered they were having a fabulous sale so we looked around a bit. And then she got me some products that have changed my life. For reals. This brush is heaven. Heaven, I tell you. It feels like soft silk gently drifting down your face. Breathe, relax, de-stress. All in a freakin’ brush. Thank you, momma. This large, rounded brush feels super-soft on your skin and is ideal for applying and blending our Extra Virgin Minerals™ Powder Foundation. 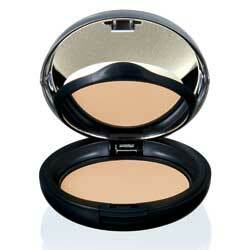 High-density, synthetic hairs pick-up ultra-fine powders and feel extra soft on the face’s delicate skin. The long-lasting, hygienic bristles resist flattening. Second, I hate liquid foundation so I’ve given it up (except on extreme occasions). Instead, I’ve been using powder. Powder from Target. $8 powder by Maybelline or some other such brand from the store. The gal at The Body Shop used the brush above and brushed on some of their face powder. WOW. Coverage. I was shocked that a powder could provide that much coverage. It evened my skin tone and covered blotchy places and it rocked. Thank you, momma. Best if you want to: Have skin that looks like yours, only better, with an easy-to-use powder-base. 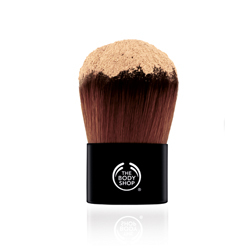 Convenient compact includes an applicator sponge and mirror for on-the-go application. Dermatologist-approved, long-lasting formulation provides smooth coverage. Third, and last, I was introduced to powdered bronzer for the first time. This stuff is awesome! The gal told me she uses it as blush most of the time or all over her face depending on the occasion, outfit, or time of year. I love it. I’ve been using it as a blusher since I got it and I think it’s awesome. Thank you, momma. Best if you want to: Create a sun-kissed glow with a natural-looking bronzer, handmade and slow-baked for up to eight hours of deliciously rich color. Community Trade organic olive oil from Italy helps to condition the skin. Community Trade shea butter has antioxidant vitamins A and E to help protect and nourish skinCommunity Trade marula oil from Namibia helps to repair skin’s moisture barrier, leaving skin soft and supple. These products have changed my life. Like, for reals. And they weren’t very expensive comparatively. I’m definitely going back to The Body Shop soon. I want MORE. By actively seeking out and using better products I not only look better but I feel better about myself. I feel like I’m not compromising on some cheap product that I don’t have a lot of faith in before I even use them. My mom said something interesting to me when I was lamenting about my products. She said, “I don’t know why women always go cheap on their products when it’s the one thing that we consistently use nearly every day. We act like it’s not a necessity and it really is.” Amen. So, do me a favor, okay? Buy something good for yourself. Even if it’s just one thing. One thing that you have faith in and makes you feel like a million bucks. Buy it, use it, OWN it. Ooooohh, yay for mamas! So glad you got to try this things out. 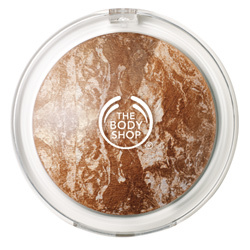 Have to admit, I’ve always been intrigued by bronzer, but to scared to try it. Don’t be scared. Embrace the bronzer. But make sure to exfoliate first. The gal at the shop put some on my face and said to my mom, “you see how it’s just sitting there? She needs to exfoliate. Then it will look perfect.” So if your bronzer or powder is “just sitting there” then you need to exfoliate. Good to know.